I was soooo excited when I stumbled upon an Essence cosmetics display at my local Ulta a couple weeks ago. I believe this is a new line to Ulta (possibly within the past few months?). I am so excited that Essence is finally available in the USA!!! Years ago a friend from makeupalley sent me some Essence cosmetics from Germany (an eyeliner and some shadows). 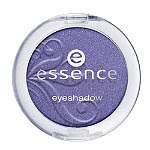 Apparently, Essence has been a leading German cosmetics brand for many years (similar in quality and price to, say, Covergirl or Wet n Wild). The eyeliner that my MUA friend sent me (Kajal Pencil in the color 08 Teddy) quickly became my go-to eyeliner (that I reached for more than my MAC and Stila pencils). It was just the most perfect medium bronzy brown that applied and wore extremely well. So, needless to say, I used that eyeliner until it was so small I couldn't even sharpen it! I searched for a similar brown in other brands, but never quite found it. So, you can imagine my GLEE when I stumbled upon this Essence display at Ulta!!! AND...most of the cosmetics were 50% off, score! The line typically runs between the $1-$4 price point, which is great, but even better at 50% off! So, I grabbed my beloved brown Teddy Kajal liner, the mosaic powder, a few eye shadow quads, an eye shadow single, and two lip glosses. All the items together totalled to less than $10. -Shadows are pigmented and apply and blend well (some are somewhat chalky, but generally a big LOVE here for the shadows). Great color selection. Tip: apply an eyeshadow base before shadows to help them adhere (I like the Mineral Shadow Primer by elf). -Eyeliners: I have only tried the Teddy Brown Kajal liner...and LOVE, LOVE, LOVE it!!! I will never buy an expensive eyeliner again. These pencils are perfect: creamy, blendable, and long lasting. And, what beautiful colors! Cant beat a $1 eyeliner that is high quality!!! -Mosaic face powder: LOVE this one too! I swirl the colors together and apply as a bronzer with my EcoTools mini bronzer kabuki brush. It provides a subtle bronze glow to my face. There is a slight shimmer that is extremely wearable. You can also use an fan brush (i love the elf fan brush) to apply the cream/highlight color on the tops of your cheekbones for a highlight. It provides a beautiful finish for your face. -Lipglosses: XXXL wand-style gloss: Nice texture, thick, yet not sticky and also moisturizing. The Super Girl color applies sheer and gives a nice pink glossy sheer color. The Glamour to Go color has a pigmented and metallic finish. -One of my shadow quads broke as soon as I opened the package, the pans were not glued in and came flying out and broke on my bathroom floor. I was able to return the product to ulta with no problem, but did not repurchase that particular color as I already had plenty of neutral quads from other brands. So, just a warning, open new products carefully and check the glue. If the pans hadn't shattered, then I would have probably just hot glued the pans back in myself. -This may or may not be a con depending on how you feel about lipgloss scents. The lipglosses have a very fruity scent. I typically prefer no scent or a light vanilla or mint scent. So, this was a con for me. But, I will still continue to use and will likely purchase other shades despite the fruity scent. Also, Essence has an online beauty forum that you might enjoy checking out: Essence Beauty Friends. It appears from browsing the Beauty Friends Board that the Europeans have much more selection! Lets hope that essence expands their US line! The colors show up really true-to-color on my *white* arm! LOL! I would love to see some swatches of the shadows and the liner if you have a chance! Thanks! Thanks so much! I love Essence stuff! Going to Ulta this week so I may pick some more stuff up. OOOO i really want to try those out!!! Hey... I was wondering if you could check out my blog? I just started and i want to find beauty bloggers i can relate to haha. It would help out a lot! Hi Makeup Sparkle! Thanks for stopping by my blog! Sure, I will head on over to your blog right now to check it out! I agree...nice to connect with other bloggers!!! :) Thanks for the comment!